A client from here in Gainesville recently visited Sound Depot and Performance to inquire about window tint and a bed cover for his 2017 Nissan Titan. After inspecting the vehicle, we showed the client several options for tint and explained the IR and UV blocking benefits of each solution. Next, we discussed how he used the bed of his truck to help him pick a cover that would provide the appearance and features he wanted. With a plan in place, we scheduled an appointment to complete the installation. The new window film looks great and offers maximum protection. The 3M window film was expertly applied by our technicians. The client chose 3M’s FX Premium tint in a 30 percent grade for the front windows of the truck. Our technicians brought the vehicle into our dedicated dust-free tinting bay to perform the installation so no debris would be caught between the film and the windows. All of our tint films are cut to fit using a computer-controlled plotter. This method ensures that the windows won’t be scratched or marred by a knife, as can happen with hand-cut tint film installations. 3M FX Premium film blocks up to 96 percent of UV rays to protect the client, his passengers and the interior of the vehicle from the damaging effects of the sun. This protection is the equivalent of a lotion sunblock with an SPF factor of 690. The film also blocks up to 22 percent of the infrared heating energy from the sun to help ease the load on the truck’s air conditioning system and keep the interior cool and comfortable. 3M and Sound Depot and Performance back the 3M FX Premium film with a limited lifetime warranty against peeling, bubbling and turning purple. The bed cover sits flush with the bed rails. With the cover folded up, practically all of the bed space is usable. The client chose one of the ArmorFlex hard folding bed covers from UnderCover. This three-panel cover is constructed from Line-X coated heavy-duty aluminum panels to withstand scuffs and scratches while looking great for years. The client can carry as much as 400 pounds on top of the cover should the need arise. The cover folds up quickly and easily after the tailgate is lowered and the catch mechanism is released. The entire bed can be used by folding the panels up behind the rear window of the Titan. The ArmorFlex cover not only looks great but protects the contents of the bed from theft and damage from rain, thanks to a dual-action tailgate seal and rubber side seals. 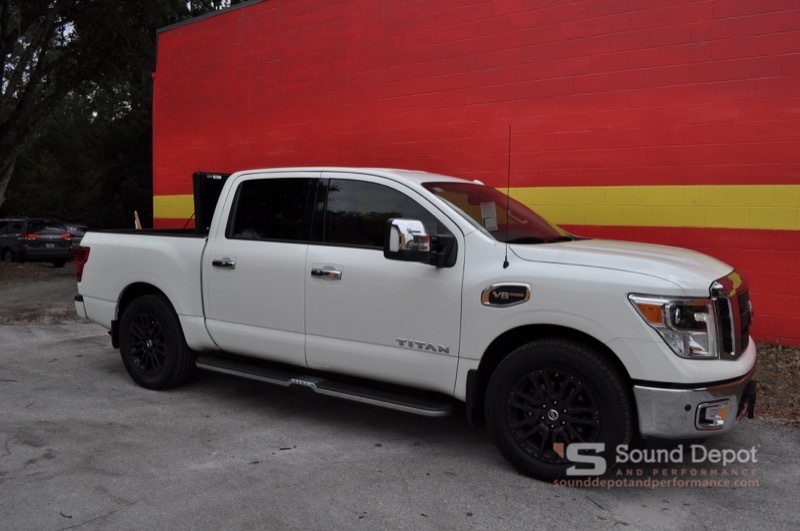 With the tint film installed and the bed cover in place, the client returned to Sound Depot and Performance in Gainesville to check out his Nissan Titan. He loved the way the upgrades transformed the look of the truck. If you are interested in upgrading your vehicle, drop by or send us an e-mail.